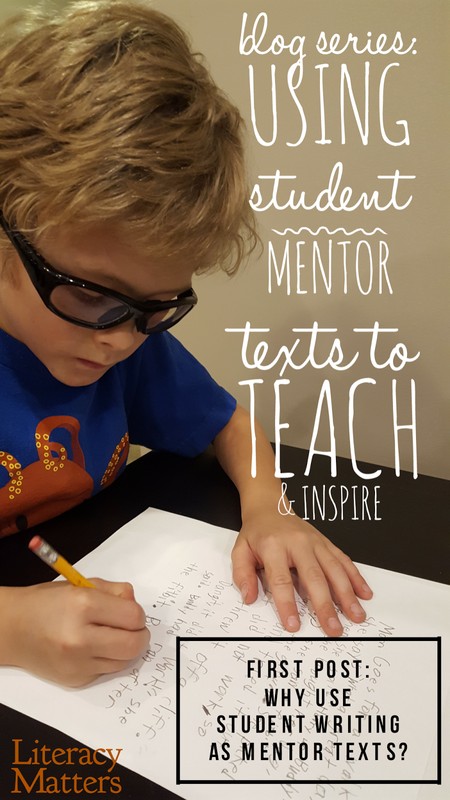 Why Use Student Writing As Mentor Texts? As writing teachers, we want our students to be confident in their abilities to write for a variety of tasks, audiences, and purposes. We want to create positive writing climates where writers feel valued and secure. 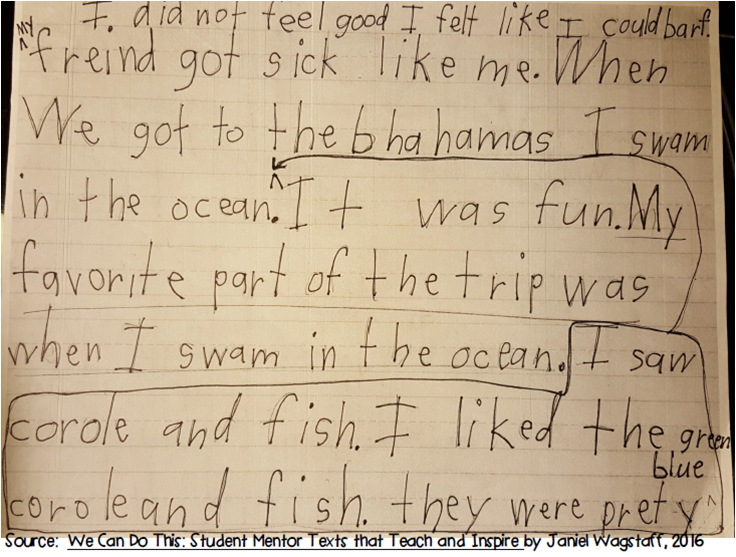 We want students to truly view themselves as writers and be moved with a sincere desire to write. 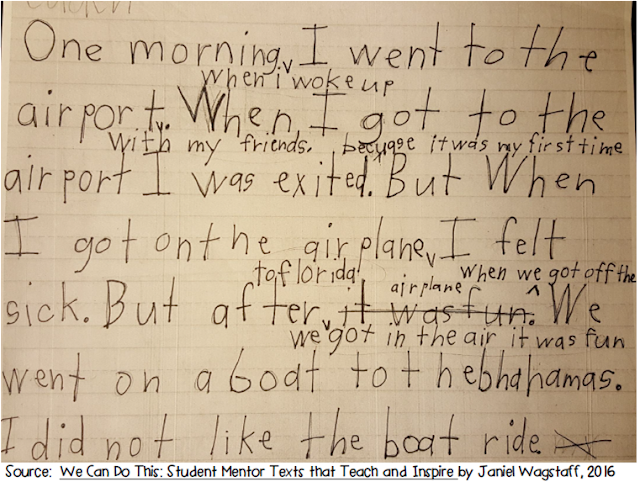 I’ve been using students’ writing as peer mentor texts for years. Watching students’ engagement, seeing their reactions to one another, and noting how this method affects what and how they write has convinced me of the power we have right at our fingertips in our students’ own pieces. How does first grader, Michael, feel when he comes forward to help me teach the class using his own informative writing about black jaguars? How might his classmates feel watching Michael’s writing be celebrated and used as a model? Might this model feel much more within reach since it was written by a peer? (Tune in to my next post to learn more details about Michael and his writing.) The answers to these questions have far-reaching implications. I’m not suggesting we throw out other methods that work. We know using trade texts as mentors, modeling writing, engaging students in shared, interactive and guided writing, and creating and using shared anchor charts are all effective in impacting students’ abilities to write. I’m suggesting we add using peer mentor texts to our go-to, best-strategy toolbelts. If we can celebrate and value our students, boost their confidence and build their identities as writers, all while teaching with a high-impact, accessible model, we’re doing much to move toward our goals. We shouldn’t leave this one out, folks. There are simply too many benefits. How might it work to use second grader, Caden’s piece, to examine writing process and the impact peer interaction had on his story? In order to make the revisions he did, Caden will tell you he reread his piece several times as he was developing it. For example, he talked-out his first sentence more than once, settling on adding two detail phrases, 'when I woke up' and 'with my friends.' He also shared his piece with peers and with me (more rereading!) as he moved along. When questions popped up for us listeners, we asked them (these were simple who, what, why, when, where and how questions), and Caden decided whether to make changes accordingly. Look closely at all the specific instances of revision and editing in this two page story. It’s rich with opportunity for highly impactful teaching and learning. Is it perfect? No. Can we learn a great deal about process from examining and naming what we see and giving the author opportunities to explain his thinking? Absolutely! Research shows accessible peer models, rather than exemplary ones, have a positive impact (Rogers and Feller, 2016). All this and we’re meeting standards, too! Consider for just a minute what it might feel like to be Caden, having your work used as a model. What might it feel like to be one of Caden’s peers? How might it feel to be part of a writing community that truly values the ongoing work of its members in this way? Aside from all the learning benefits, students experience affective benefits when we rally around their work. 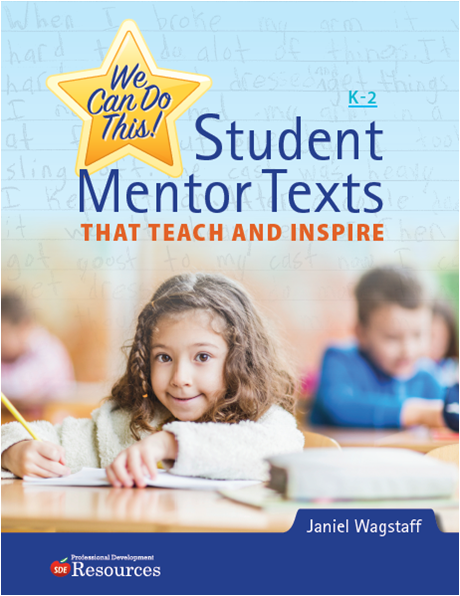 Using peer mentor texts to teach and inspire is a passion of mine, so much so that I wrote a book, We Can Do This! Student Mentor Texts That Teach and Inspire. It provides teachers with ready-to-use models written by kindergarten, first and second grade students, the majority of whom are from my Title I school. Click this Amazon link and “Look Inside” for a close-up view of how the volume is put together. As always, I welcome your comments and am happy to answer questions. As a fourth grade writing teacher, I can attest to the magic that occurs when a student text (with his permission, of course) is projected and read to the class. The class is riveted as the student reads his composition, followed by many oohs and ahhs. The discussion is rich as students explain how they composed their piece. It makes good writing seem so attainable. Thank you so much for taking the time to respond to the post, Rose! 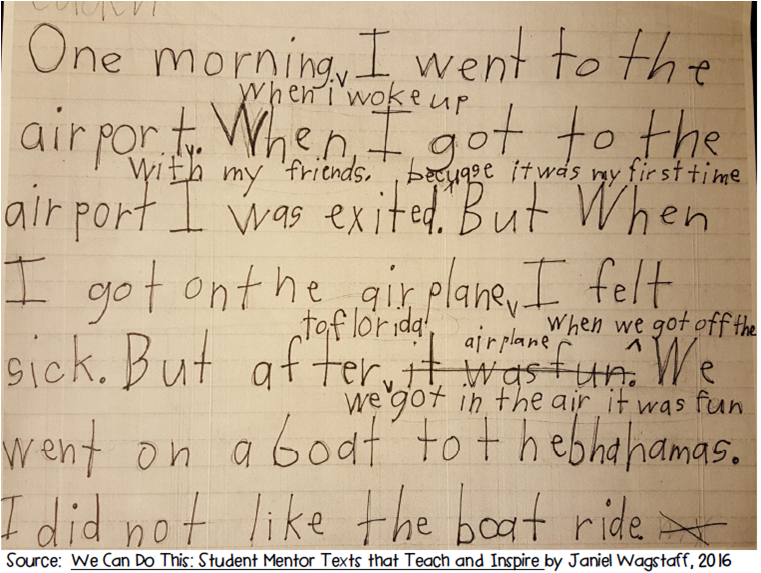 And, sincere thanks for sharing your observations about using students' writing as mentor texts. Such a powerful tool. Making 'good writing seem attainable' is a real gift to students! Have a fabulous school year! Also, the student must hold a good academic record and he/ she should have secured admission HOSPITALITY MUT by clearing the necessary entrance examinations for that course.